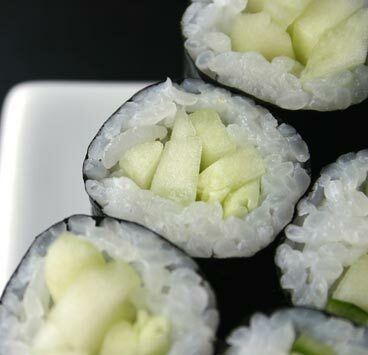 For a refreshing departure from the sushi-in-seaweed theme, try wrapping your rice roll in cucumber! Often, up to 80% of product consumed during a sushi meal is rice. Getting your sushi rice right is a crucial element in successful sushi making at home. Follow our recipe for perfect sushi rice. Cutting a good cucumber wrap is a bit tricky, but don't be daunted - it just takes a bit of practice to get it right. Begin by cutting the ends off a straight, evenly shaped cucumber. Peel the cucumber and slice it horizontally to make two cylindrical halves. To make a thin, nori-like sheet, hold a cucumber half against an 8-inch knife and carefully make a spiralling cut along the outside of the cucumber. For a visual aid, imagine you're trying to peel the skin from an apple from top to bottom in one piece. Toss away any lingering seeds, and voila, you now have your very own cucumber wrapper. If you'd prefer a shortcut, you can just scoop out the insides of the cucumber halves, leaving a thin skin into which you can stuff the rest of your ingredients. If you prefer this alternative, finish by dividing your stuffed roll into bite-sized segments. If you're feeling up to the adventure of actually rolling the cucumber around the rice, start by placing a cucumber wrapper on a bamboo mat (makisu). The wrapper should form a 5 inch sheet and lay relatively flat. Cover the cucumber with an evenly spread layer of rice. About 2 tablespoons is a good amount. Add some wasabi and Japanese mayonnaise to taste. Place the rest of your ingredients in the centre of the wrap. With the help of the makisu, roll the cucumber until its edges overlap slightly. This will allow the rice of the top layer to stick to the bottom one. Slice the roll in half and then slice those again in halves to produce 4 pieces. And there you have it - perfect cucumber rolls!